Coral Gables, FL – After stumbling against Rutgers last Sunday, sophomore Evan McKendry had something to prove as his next opponent was a daunting one. The right-hander was going to face off against the defending champion Florida Gators. 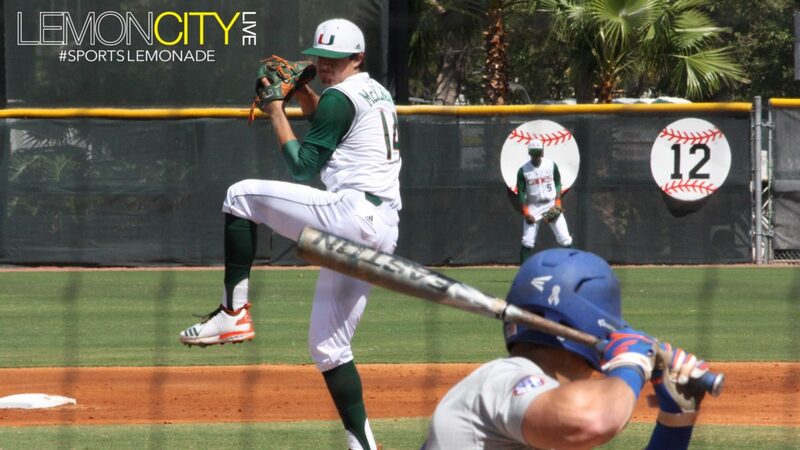 On the strength of his breaking ball, the Miami Hurricanes staved off a white-hot Florida Gators team, handing them their first loss of the season with a 2-0 shutout in front of a large crowd at The Light. In doing so the Canes salvaged the weekend series, ending a 4-game skid. The Gators had won the first two meetings prior to Sunday’s game. Early into the season, the squad has been facing problems at the plate, striking out a horrendous 49 times in 6 games. Worse, they’re batting just above the Mendoza Line at .203. The stat proved irrelevant, if only for today. The Canes started off the third on a hit-by-pitch sending Freddy Zamora to first followed by a base hit from Willy Escala. Afterwards, third baseman Michael Perez moved up the runners another 90-feet with a grounder to the right side but UM’s momentum was cut short when Romy Gonzalez popped out to deep center, ending the inning. It only delayed the inevitable. At the bottom of the fifth, Escala doubled with two-outs followed by another two-bagger from lead-off man Michael Burns, putting Miami out in front. The Gators threatened in the sixth after Austin Langworthy laced a single, swiping second shortly thereafter. Despite this, McKendry stayed true to form, striking out both junior designated-hitter Nelson Maldonado and right-fielder Wil Dalton muzzling the Gator attack. McKendry was replaced in the seventh by the righty, Andrew Cabezas ending a fantastic day on the mound going 6-deep, scattering two hits and nailing down a season-high 8 strikeouts keeping Florida off the scoreboard. Cabezas continued where Evan left off retiring the first two hitters, but then he literally “walked” his way into trouble, loading the bases before getting Langworthy to pop out to center-fielder Tony Jenkins ending the threat. 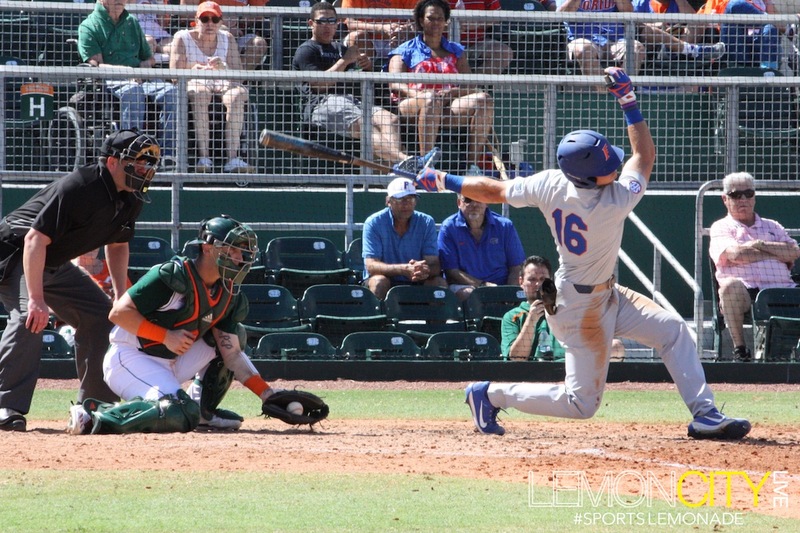 Cabezas, like McKendry, would continue to frustrate and hold down the potent Gators offense, striking out three straight hitters in the ninth to end the game. The duo held our in-state rivals to just three hits. The Hurricanes tacked on an insurance run after the seventh inning stretch as Burns singled through the right side bringing in Zamora. Miami recorded 7 hits with one error, stranding six runners on base. By comparison, the Gators stranded 9. Burns finished the day going 2 for 4, scoring both of UM’s runs, recording his second double of the year. Escala bumped up his average going 2 for 2 including his first two-way of the year and drawing a walk. The team will now travel to Boca Raton for a date with Florida Atlantic University on Wednesday before returning home for a 4-game slate that includes a doubleheader on Saturday against Maine. CLICK HERE for a photo gallery of this game.